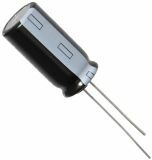 Electrolytic capacitor with operating voltage 450 V, rated capacitance 33 uF and operating temperature 105 °C. The electrolytic capacitors are frequently used for filtering of signals in AC circuits or of DC signals with AC component. terminals pitch - 7.5 mm.